The Direct Thermal Bar code ContourBand provides the ultimate in quality, comfort and durability for Medical ID Wristbands in multiple styles and colors. ContourBands are compatible with our E2 printers, Zebra printers and more. Roll format mirrors the traditional shape of hospital wristbands: narrow strap and wide patient data area. Special outer wristband coating allows for crisp printing and excellent bar code scanability. Soft, lightweight Polyethylene material provides maximum patient comfort and security. Large white information area is the same as or traditional wristbands. Perforated removal strap converts into traditionally shaped wristband. Easy-closing, and secure snap is more patient and applicator friendly with flat, rounded edges and improved ergonomics. Adjustment snap holes are closer together, providing a better range for adjustment onto patient wrist. Available in 6 colors: white, blue, yellow, red, orange and kelly green. 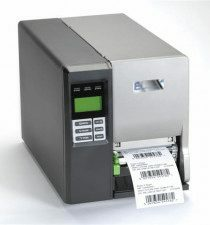 Available in 2 shapes and 10 roll configurations to easily operate with current bar code printers.